Welcome To Eisinger Smith, Inc. 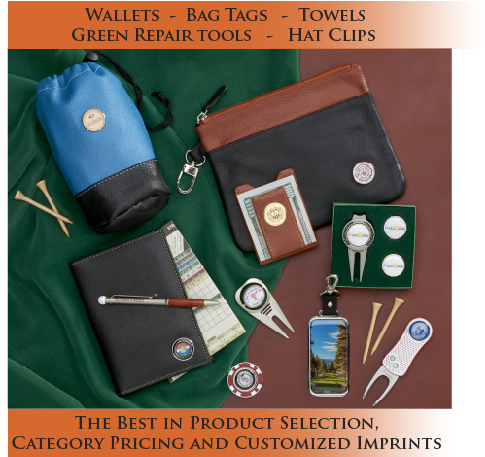 Since 1980 Eisinger Smith has been providing the golf industry with innovative and quality golf accessories and tournament gift ideas. We offer two distinct lines of golf accessories: Eisinger Smith Custom Golf and GolfPro Collection, with both lines offering contemporary styling and accents. Eisinger Smith's signature golf items can be found at pro shops throughout the world as well as at the most prestigious tournament events. Our full grain leather bag tags, money clips, leather canvas travel items are just a few of the exciting accessories that await you on our web site. We invite you to experience our complete selection of golf accessories and tournament gifts as you browse our online presentation.